/ Modified jul 26, 2010 7:25 p.m. 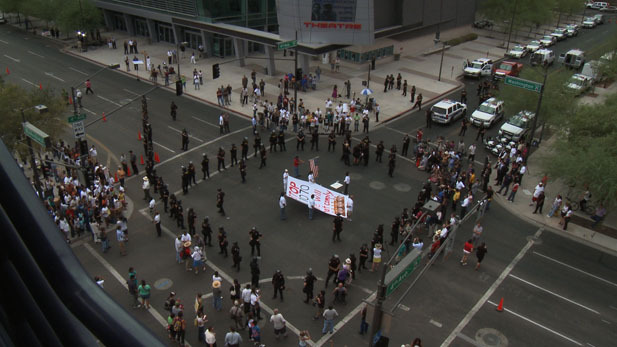 Supporters and opponents of SB 1070 gathered outside the Federal Courthouse in Phoenix one week before the law is supposed to take effect. Judge Susan Bolton heard arguments in two separate hearings from civil rights organizations and from the United States Department of Justice. Regardless, residents of Arizona, and elsewhere, assembled to block a downtown intersection during the second hearing. Several people in the center held a sign reading, “Stop 1070, we will not comply.” At least seven of those people were later arrested for refusing to clear the intersection after police had asked them to do so. John Bouma, a private attorney representing Arizona acknowledged that Bolton could strike parts of the bill, though he was confident she would not strike it down entirely. He stated that he believes she will make individual decisions on each section of the law. Bolton did not indicate when she would make a decision. SB 1070 is scheduled to take effect on July 29th, and protesters are preparing for a march.